Here she is—all wrapped up. :) I have had a few people ask about the wrap I chose for Maya. I actually am wearing a different wrap in the photo than the one I purchased. I have a neighbor that insisted a newborn needed a little stretch in the wrap. And she's right. It's easier to snuggle her against my chest. So for now I am borrowing a wrap of hers that she actually "made" herself. She just bought 5 yards of semi-stretch fabric, and voila! And I am using the wrap methods that came on the DVD from the the wrap I ordered before Maya was born, the Wrap N' Wear. 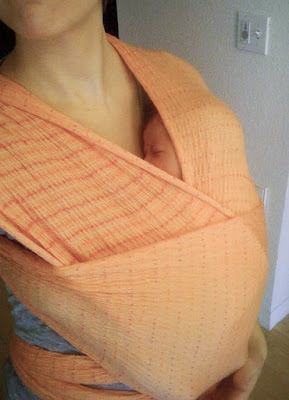 The Wrap N' Wear is made from 100% crinkle cotton, so it is light weight, which was a biggie for me. I also opted for a wrap that didn't have stretch, because after about 2 months baby gets too heavy for stretchy wraps, and they sag and lose the support that 100% cotton wraps offer. It also comes with a great DVD that illustrates LOTS of different ways to wear the wrap, even while nursing, or carrying twins! I really like my Wrap N' Wear, I just am not using it as much while Maya is so tiny (she's a month tomorrow, and still under 8 pounds). I really love the wrap idea. I will check out those sites. I used the same type of wrap. I had around 12 different carrying options but the one you are doing in your picture was my favorite. I have three kids so it was nice to put on in the stroller, one walked and I carried the other and it made outings SO much easier. Plus, it kept strangers from sticking fingers and faces into my little ones face. so cute! i love babies in slings. I love the Moby wrap. Couldn't have lived without it! have a gorgeous shining day! I just love that wrap idea too - I wish I had thought of that vs the sling I bought. I rarely use the sling, so I actually just lent it to a neighbor who has a newborn and they are getting a lot of use out of it. They call it the magic sling because it's the only way she can get her daughter to sleep! she looks so cozy and cute in there! while visiting Korea when Kaia was 9 months old, I watched women carrying their babies in wraps....but on their back. I wanted to push those babies around to the front side so badly....but that is tradition in Korea. I bought one of their wraps (quilt style blanket with ties) and brought it home and it became mine and Kaia's new best friend for the side hold as she got bigger. Wraps have come a long way in the last 5 years. Yeah for mommy inventors! And yeah for Maya loving hers! Thanks for all the advice. I've always known I'd like to try a wrap when (hopefully!) we have children. Maya looks so snuggly! PS my word verification is 'rested' - very apt! What a sweet picture- I can't believe she's still so small! I have a Maya wrap and like it but the stretchy fabric idea is interresting. Where do you get the alarm for their bed? I've never seen those. Have you tried the Maya Wrap for Maya?? :) I work for the company, I handle her marketing and pr and I just helped her launch a new organics line. They are beautiful. My favorite is the black and white. I think you would like them b/c they are more open than a wrap, but still adjustable for a tight fit. I just used one with my youngest baby (I wasn't a babywearer before working for Maya Wrap) and I will never be able to go back to something I can't adjust. I fluctuated between my Maya Wrap and Baby Bjorn depending on the situation, but loved the wrap b/c baby could face out at a younger age and when he fell asleep I would simply lower him down to a recline position. And the tail is great for discreet nursing....like having a nursing cover combined.